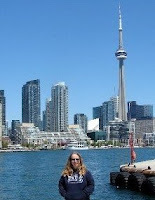 Today marks 30 years since I moved from Nova Scotia to Toronto. To celebrate, I had an "east coast" donair for lunch at College Falafel (at Ossington Avenue and College Street). I've gone by this place many times over the years and have seen the "East Coast Donairs" sign but have never stopped in until today. There is a wide variety of condiments and I got just tomatoes and donair sauce. The donair is served in a pita pocket, which isn't quite traditional but worked out okay. It was delicious and messy. The meat was good and the sauce was tasty. Here I am with my donair and my East Coast Lifestyle teeshirt Sister Sarah and Joey gave me for Christmas.